Our scheduled new home visits are designed to ensure homeowner satisfaction. Experienced service technicians perform a thorough walk-through of the inside of the home along with an exam of the exterior. During the course of the visit, we will perform minor repair work, double check operating systems, and go through routine maintenance items with the homeowner. With visits scheduled after closing at approximately 30 days, 90 days, and 11 months, the goal is to have homeowners as happy with their purchase a year after their move-in as their first day in the home. The visits are geared not only to ensure homeowner satisfaction, but to also make sure homeowners are comfortable with the maintenance and care necessary for the longevity of their new home. Click HERE to see what our very satisfied customers say about this program! 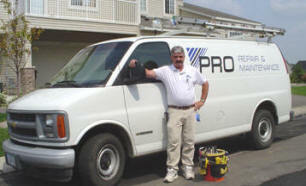 Pro Drywall & Painting, Inc.